RUSH: Vice President Pence is here. Welcome, sir, once again, back to the EIB Network. Happy to have you here. THE VICE PRESIDENT: Thank you, Rush. Great to be back on. I thank you for the opportunity to speak about the extraordinary events taking place in the aftermath of Hurricane Harvey. I know that millions of your listeners are supporting the families and communities that are affected with prayers, and supporting organizations are coming alongside. But I appreciate the opportunity to talk about the efforts of the federal, state, and local governments to provide resources and support for rescue and recovery. RUSH: How is it all going? How would you assess…? I know you’re biased, but how would you assess the effort so far? THE VICE PRESIDENT: Well, I will tell you. I just walked out of FEMA. President Trump directed me to head over there for a quick update, and I think it’s important that all of your listeners know that this is still a very dangerous storm, particularly people in the affected areas in Texas and Louisiana need to approach this with great caution. Listen to local emergency management officials; heed their warnings and direction. But I think the American people can be very proud of the effort that Governor Abbott in Texas and local first responders are making, and I’m very proud of the strong leadership President Trump has provided for our entire administration. We have more than 8,500 federal employees on the ground. We have dozens of Coast Guard assets in the air — fixed wing, helicopter. Coast Guard is involved in rescue operations. 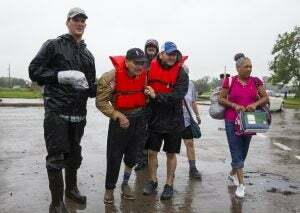 And, frankly, you know, the volunteer effort that is also underway where people are heading out, looking after vulnerable neighbors and friends who are stranded in the midst of this historic flood is… It reminds us of everything that’s great about being an American. But, look, it’s early in this process. We’re a hundred percent focused on lifesaving efforts right now. But the president and the first lady will be there tomorrow. We already have our FEMA director, Brock Long, on the ground in Texas today. 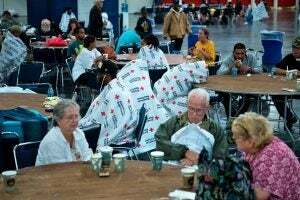 But once the floodwaters subside, then the real work of recovery will begin in earnest, and we’re gonna be making sure that upwards to a half a million Americans that may be eligible for disaster assistance know that we are with them, we’ll support them, and we’ll see Houston and southeast Texas all the way through this crisis. RUSH: Well, you know, you mentioned something here that I have observed myself, and that is that… It’s a sad thing, Mr. Vice President, that so much in our life has become politicized. But this incident… It has its political elements if you go to the wrong places in the media. But people that are on the ground there don’t seem to be involved in that at all. There is a great display of self-reliance. There’s a great display of neighbor helping neighbor, Americans setting aside whatever it is that divides them — and it may not be that much anyway — and all banding together to help. It seems like a unified effort here. You have a number of celebrities that are running charitable donation efforts here. It seems like a lot of things came together immediately when this storm hit. Even some of the things got set up before the storm hit, and it seems like it is being met as well as it could be. THE VICE PRESIDENT: Well, we’re leaning into this effort, but I don’t think it could have been said better than you just said it. These moments bring out the character of our nation. We’ve seen the generosity, the compassion, the courage of the American people in high relief. Whether it be the first responders who… You know, the Coast Guard is in the air, was in the air as of yesterday. Even though, you know, this is still a tropical storm. I mean, you have first responders who have risked life and limb to rescue families that were stranded after Hurricane Harvey made landfall. But to see the way that people are volunteering, to see the way that people are contacting the Red Cross, the Salvation Army, Samaritan’s Purse and other organizations and providing the necessary financial resources that those groups are already deploying on the ground is… It just… It really is deeply inspiring to President Trump and myself and to our entire administration. But I can’t say enough to your millions of listeners — particularly those in the affected areas and with family in the affected areas — just to know, this is still a very dangerous storm. And while the federal government is there now with more than 8,500 officials on the ground, we’ve been moving literally millions — over a million meals and over a million liters of water. We positioned Coast Guard assets, Navy assets. But the reality is that this is a long way from over. THE VICE PRESIDENT: It could get worse before it gets better with additional rain coming. THE VICE PRESIDENT: That’s right. RUSH: — gonna be a longtime, ongoing effort here, wouldn’t you say? THE VICE PRESIDENT: Right. You know, it will be, and people within the sound of my voice who are in the affected areas or have families should know that they can go to DisasterAssistance.gov, and they can already begin… We have some 22,000 that have already registered for disaster assistance. And there’s a broad range of financial support that’s available to support housing, to support businesses that are affected by storms of this magnitude. We think there might be as many as a half a million people eligible given the enormity of this storm. THE VICE PRESIDENT: People can go to DisasterAssistance.gov and already begin to register for that assistance. But your listeners should know, Rush, a hundred percent of our focus — a hundred percent of the focus in that room in FEMA that I just left five minutes ago — is on the rescue operation. It’s just so important that people listen to local officials. If they’re to shelter in place, to stay there, not to return to areas that have been evacuated, not to attempt to get out into what is still a very dangerous storm. RUSH: Mr. Vice President, I’m down to five seconds, and I know you have your meeting to go to. Thanks for making time for us today. I’m sure it was valuable and worthwhile for many.